“The world is not a whole, but rather worlds living in a world, ” costume designer Mitsushi Yanaihara describes Nibroll‘sNo Direction during a post-show dialogue. The collaborative work is a joint effort of a choreographer, filmmaker, music director, costume designer and lighting designer. Mitsushi’s description is reflected in the numerous costumes in the show. The costumes are made of similar material and design, except of the minor detailing of pattern and style, making the sets of costumes very different from each other. Choreographer Mikuni Yanaihara also says “her white is not your white”. She explains that each person’s perspective and outlook of life are different, even though we are living in the same world. This show questions the theories of realities – the rules and laws – that this world is built on. For example, they question the law of true reality and argue that we are consistently living in the realm of imagined realities. No Direction portrays identities that were often blurred, because of rules that were set to forced people to what the laws wants them to be. For example, they propose that gender is constructed by society and is not part of an individual. It explores and ventures into a world without rules, in hope of seeking answers to these theories and questions. No Direction starts with a bang literally. The music booms so loud that your heart flutters that second. The dancer, walk out in huge steps, almost as if they’re marching. Donned in black and smeared black eye make-up, they resemble zombies. Walking aimlessly in circles and pointing, they search to break free from the imagined realities – searching to find their true selves. You could almost hear their silent cries in their poignant expressions. 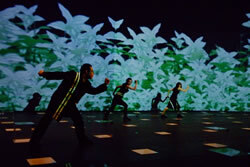 The choreography uses daily life movements, such as walking and running, to bring the dancers to a level that’s as close as a normal human as possible. The choreography also involves release technique, which is a technique that uses minimum strength to do massive and large movements, by using the release of the limbs at the peak of the energy to give that powerful swing. Raw energy in the dancers oozes out in every step they take, making every throw and fall easy. Repetition is used to show a repetitive lifestyle that most people tend to go through. In the whirlwind of movement, sound and lighting, one gets caught in the crossfire of a desperate search of a true reality, bounded without rules. UrbanWire feels that even though the movements used to represent this are awkward, it is also very beautiful in their way. This is because, unlike the constructed perfection of ballet, the ugly and almost distasteful movements force you to look beyond the superficiality of the movements and deeply into their representations, which truly reflects society today – the suffering and desire to break away from the constraints of today. The clear box that is scattered in a specially arranged manner acts as the metaphor for the world. Choreographer Mikuni explains, in the post-show dialogue, that she initially wanted to use a globe. She later changed her mind, because the symbolism was too obvious, deciding on a clear box instead. It’s clever of her to change it to a box because one will then be led to think that the dancers are telling their little secrets. This creates different meanings and perspectives that this collaborative work hoped for. If she did use a globe, she won’t be questioning the theories of realities, but rather, conforming to these theories, because a storyline will be created and rules, enforced. As you watch, your eyes consistently wander to the backdrop where the visual images are displayed. While the visuals are stunning, it’s also a distraction to the work, as it did not make any sense to the dance choreography. Movie director Keisuke Takahashi later explained during the post-show dialogue that these movie clips were based largely on the title of this work. He also feels that he shouldn’t be constrained and bound by rules. Many times, the audience would have to interpret these visuals on their own experiences, giving a different outlook on this show. The images, such as pandas and computer images flickering, are metaphors that are up to the audience’s own interpretations. This left the audience hanging and wanting to find out more. As suggested by its title, this performance doesn’t have a storyline. Instead, no direction comprises excerpts of the choreographer’s life. The scene changes from the madness that represents the world to the memories of her life, such a playing with a friend and funeral of her grandfather, before going back to sheer madness. While the costumes and lighting adds colour to stage and the dancers, the work is consistently depressing and solemn. For example, the scene when a dancer talked about his thoughts about the deaths of his grandfather, who choked on a rice cake and died, is surprising colourful and rather lively. Two other dancers are donned in interconnected robes that also make up the props, such as the curtains and sofa. They walk away from the props slowly and expressionless, dragging their robes and leaving a long trail of cloth, while two other dancers are in robes that had metres of cloth dragging the cloth over to the edge of the stage. This imitates a funeral wake where everyone mourns for the dead. The dancer talks about the funeral, upping the gloom factor by a notch and further enhancing this experience. All hell breaks loose when the music changed. The dancers started to dance frantically, now back in the madness of the world. In the rapid whirlwind of movement and sound, one is once again trapped by the energy of these dancers. You immediately enter the luminal stage, which causes you to forget who you are and where you are. Soon, you are part of them, dancing and spinning into the madness of joy and pain at the same time. After a while, however, the choreography got so senseless and boring, as they kept repeating the movement combination for a period of time, that one loses interest and starts paying attention to the visuals in the background. This, UrbanWire feels, is a clever trick that relegates the dance into the background, rather than being a focus point throughout the show; this is, after all, a collaborative piece, and not a mere dance piece. Finally, the dancers come to a stop onstage, right in front of the visuals showing the silhouettes of the dancers. Then a dancer falls to the ground, as one of the silhouettes on the screen disintegrates. The silhouette, still dancing, crumbles and forms many tiny other silhouettes. This act questions the theories of globalization and feminist theory, in which the world lacks a satisfactory definition. It is globalisation that resulted in the thoughts, actions and ideas that lead to the global integration of culture. As the title of the piece suggests, the world right now had lost direction. Perhaps with global integration, the world will no longer have a proper direction or goals anymore; you will lose yourself to the world and find that you have lost your voice to speak for yourself. Who protects us in this world? Is it the world leaders who claim to know what’s right for us? But are they also humans, who might naturally protect their selfish aspirations and desires? Or could it be society, with their carefully drawn boundaries and artificial constructs? With these questions running through your head, you leave the show. There will, you think, perhaps be no answers to these questions. Photo courtesy of Ming Tang. Contributor bio: Denise Ong graduated from LaSalle College of the Arts with a Diploma in Performing Arts (Dance), with strong background knowledge and skill in ballet, contemporary and Chinese dance. She’s currently a dancer in Frontier Danceland. In addition to teaching dance part-time, Denise is also a scholar and dancer for Cheng Ballet Academy. This article is part of UrbanWire’s 9-week Singapore Arts Festival 2008 special . Get all the latest Arts Fest updates and reviews on UrbanWire.